The AEGEE Summer Universities celebrate a great anniversary this year. For the 25th time in the history of the European Students Forum AEGEE members travel across Europe in order to take part in a two-week course that offers a key to understand other countries, languages and cultures for the smallest fee possible. This is reason for the Golden Times to look back on the history of AEGEE’s most successful project in a series of articles. We start with an interview with the organiser of the Summer University “On the Way of Saint James, a trip through the Stars’ Route”, organised by AEGEE-Leon. This Summer University received the highest evaluation result by the participants of all SUs. The topic: walking on the most famous pilgrimage route in Europe, visiting cities and monuments on the way. The Golden Times interviewed Jose Maria “Txema” Palanca de la Varga, main coordinator of the Summer Event. Golden Times: How did you react when you heard your SU was the best in 2011? Txema: The truth is we are very happy to have been the first. Everything went well in the Summer Event and we expected to be among the first, but were pleasantly surprised with the first place. Golden Times: What was the SU about? Txema: Our Summer University was a little different from the typical Summer University. The main theme was the Camino de Santiago, the pilgrimage route to the Cathedral of Santiago de Compostela in Galicia. We also wanted to show our city to people of AEGEE. So we thought of an event that combines both aspects: joining the fun aspect of a Summer University with the cultural factor of the Camino de Santiago. Every year many people from around the world are walking on this route and we thought about doing a small part walking with a group of people from AEGEE. Top grades for Leon: the evaluation results of the top 35 SUs in 2011. Click on the picture for a detailed view. Golden Times: How much did the people have to walk? Golden Times: Except for the topic, what was special about your SU? Txema: Also we had a great group of participants and a good group of organisers. For me, as the main coordinator, it was very easy to work with the wonderful group of organisers and the fantastic group of participants we had. Golden Times: How many people applied for the SU? Txema: I remember we had about 40 applications. We had originally 15 places, but we extended the number to 18, because the applications that we received were very good. Something that surprised us very much was that none of the 18 people, who confirmed in June, cancelled their participation in the event, which took place in September. Golden Times: Did people get blisters? Txema: Yes, some participants had blisters, and others did not have any problem, depending on, among other things, the training they had done before. We had a first-aid kit, which was very useful, we also had a private health insurance, in case there had been bigger problems, and we also had a support van for those who could not walk. But I have to say we had no really important problems. All participants completed the route on foot. Golden Times: The Saint James’ Way was originally a religious route. Also today? And how was it for your group? Txema: Actually there are several options: religious, cultural, sports… I think most of the participants and organisers did not have a single reason to participate, but rather the combination of some of these reasons led them to join. The group was very diverse. In total we were 25 people from 12 different nationalities and different religions, Catholics, Orthodox, Lutherans, Muslims and agnostics. Golden Times: Did you get in contact with a lot of other pilgrims on the way? Or did the group stay among itself? 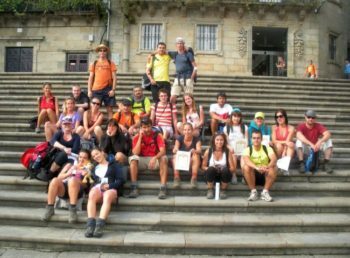 Txema: Before we started walking, we spent a few days in Leon and created a sense of group spirit. While walking on the way we related to other people outside the group, but in the hostels and during the meals, we were together as a group. Golden Times: Can you tell us a funny episode of the SU? Golden Times: Did you have SU couples? Txema (smiling): Not too many, but we had some. Golden Times: You were one of five antennae that actually organised two Summer Universities in 2011. Why? Wasn’t one enough? And what was the difference between them? Txema: In 2011 year we were one of the antennas with many active members. When we started designing the Summer University project, there were two groups of members with very different ideas about organising a Summer University, both in theme and dates. So we agreed to do two working groups and to make two different Summer Events and our fund-raising responsible began working to obtain the necessary funding. Golden Times: Seeing the huge success of the Saint James SU, would you do the same concept again? Txema: We will repeat the same concept again in 2012. The SU On the way of St. James, vol. 2: “Follow the stars to the ocean” will take place from 22nd of August till 5th of September 2012. SU Bratislava/Katowice: Wake Up the Slavic Hero in Yourself!